Frankincense is believed by many to possess powerful healing properties. Frankincense essential oil is said to reduce inflammation, prevent infections, relieve anxiety, boost the immune system and fight cancer. It is used as an internal and topical aid to address skin issues. Additionally, researchers at Baylor University Medical Center in Dallas have found that frankincense regulates epigenetic machinery. These are the mechanisms essential for normal development and maintenance of tissue-specific gene expression patterns in mammals. This regulation is believed to contribute to the potential use of frankincense as a cancer-fighting and prevention aid. 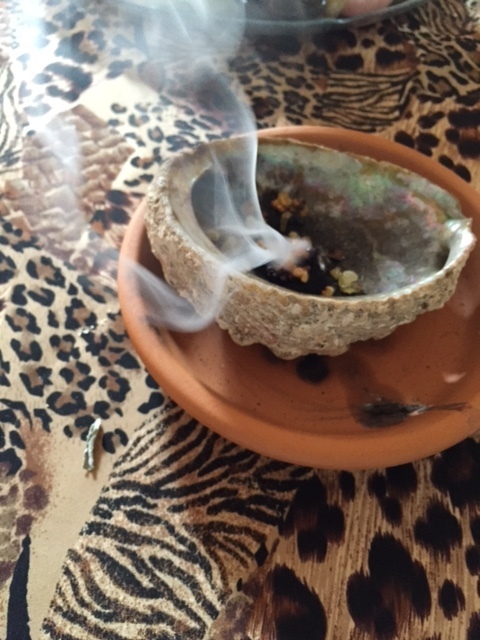 In 2008, the Federation of American Societies for Experimental Biology summarized that burning frankincense may be a viable way to alleviate anxiety or depression. Burning frankincense resin is common in religious and spiritual rituals for purification, meditation, spiritual protection and to enhance spiritual development (psychic energy). The sweet aroma is immediately calming and brings about a sense of peace and connection to one's soul and Source. Raw incense resins are also referred to as oleoresins. Resins are the oldest forms of incense, used long before sticks or cones. My favorite magic and healing rituals involve burning frankincense or myrrh resin on a hot charcoal puck. As the oleoresin melts, its essential oils (oleo) are released first, followed by aromatic smoke. 1. Place about 2” of ash or sand in incense burner, forming a cone shape or mound. 2. Holding charcoal puck with metal tongs, light the edge until you see tiny sparks. 3. Place charcoal puck (concave side-up) on top of ash or sand mound, being careful to leave the edges exposed for air to flow around the charcoal. 4. Allow charcoal to sit for 3-5 minutes, until it glows red with heat and is covered with gray ash. 5. Being careful not to touch the charcoal (it can heat up to 1500 degrees), sprinkle a small amount of resin in the indention. ¼ to ½ teaspoon is enough, as more may smother the charcoal. 6. Enjoy the aroma and smoke of the burning incense, feeling free to add more resin as the smoke thins out. Charcoal puck will remain hot for up to 60 minutes. Do not discard for at least 2 hours to allow proper cooling time. Even then, use tongs to avoid burning your hands.